By late morning the air temperature had climbed to about 42°F. 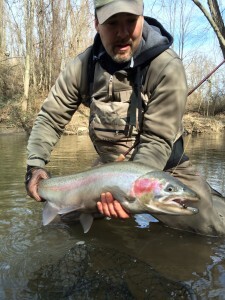 It was downright balmy by the standards of early February steelhead fishing. Cocooned beneath my waders in multiple layers of fleece I was actually too warm. I would have gladly traded some of that warmth for a fish or two. But the first four hours of fishing hadn’t produced even a nibble. It was the same all up and down the river. We passed a dozen or so other anglers, almost all were fishing bait: casting shrimp with spinning rods or center-pin rigs. Nobody we talked to had caught or even hooked a fish. My guide Aaron was about ready to pack up and move upriver above the dam. The fishing day was half done and we were started to feel the pressure. But before we hopped in the car, he wanted to make one more pass back at the first hole we had fished at dawn. We had tried a variety of flies already. Copper Johns and other generic search pattern nymphs. Egg patterns. A black stonefly. None had elicited so much as a strike. At the moment I had on a Prince nymph. I drifted it through a run I had already fished at least fifty times. It was a nice drift through the sweet spot, with no drag. Satisfying to accomplish. But I’d made plenty of good drifts earlier and none had produced. I had set the hook twenty times only to find my hook had caught a leaf, or a twig, or bumped along a rock on the bottom. So when my line stopped and twitched, and I instinctively lifted my rod to set the hook yet again, I wasn’t really expecting anything. Then the river exploded. 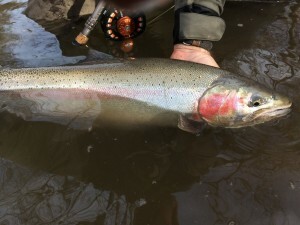 Attached to my line on the other end was a ten-pound hog: a fat, chrome male steelhead with a girth and shoulders as big as any steelhead I had ever caught. And where had I hooked that fish? In the very promised land of trout fishing. 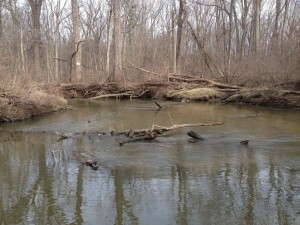 The destination that trout anglers and fly fishers all over the world dream of visiting one day: Indiana. Well, okay. Not quite. Until a few years ago I might not have known the state of Indiana even had any trout. My mother’s family came from southwestern Indiana, not far from the borders of Kentucky and Illinois. Many of my early formative fishing experiences were with my great uncle catching rock bass, crappies, and pan fish in the old quarries. But it was not trout territory. Northern Indiana, however, abuts Lake Michigan. And about fifty years ago, a variety of pacific salmon and strains of steelhead were introduced into the lake in order to control an overpopulations of invasive alewives that had found their way into the Great Lakes (possibly in the hulls of shipping liners coming up the St Lawrence.) The alewives, with no natural predators, had overpopulated and were washing ashore and rotting in such malodorous numbers they had to be cleared away with dump trucks. So the neighboring states took care of one introduced species with a few more. Thanks to an abundance of alewives as food, the steelhead and salmon thrived, and tributaries all around the shores of Lake Michigan suddenly became amazing fisheries. The particular tributary I was fishing that day was Trail Creek, which flows north through a town of the same name, and on into Michigan City (Indiana) where it drains into Lake Michigan. Though passing through a city, the stream itself was protected by a sort of green belt: a mix of public parks, edges of golf courses, and protected private lands and gardens. It was wooded and quiet, and until the very end of the day when I found myself casting under an interstate, I never felt like I was in a city. I had as my guide Aaron Cameron of Trail Creek Guide Service (http://www.trailcreekguideservice.com/services.htm, https://m.facebook.com/trailcreekguideservice/). And I was glad I did. 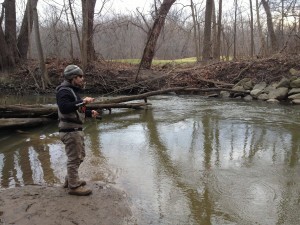 Trail Creek was unlike any steelhead stream I had ever fished. Although there were parks and public access points for anglers, Aaron had rights to several private stretches. We fished a mix of both public and private spots so that I could get a sense of the river as a whole. The public access points all had a number of anglers (though nothing like the combat fishing in Pulaski). One access was just above a lamprey control dam, where over the course of five minutes I watched a half dozen steelhead make failed attempts to leap upstream. But just as we arrived there, three other anglers stepped into the spot where we were headed so we left. By contrast, we had the private wooded stretches to ourselves. And equally important to this access, was that my guide knew the technique for fishing this water. He called the water “froggy”. Though I had never heard that term, I understood what he meant. It was a slow and meandering stream, with mostly silt-covered bottom and only rare stretches of gravel. The slow-moving water made it difficult to get a nymph to drift, and the water was enough off color that I would have had a difficult time reading the stream on my own. Aaron had been fishing the river since he was a kid, however, and his knowledge of the place and the techniques for fishing it was invaluable. In places the stream was littered of fallen trees and log jams. A few spots I fished, I couldn’t have imagined actually being able to land a big steelhead even if I had hooked one. As if in confirmation, Aaron brought me to one nice looking stretch. “I’ve hooked a lot of fish drifting flies under that log,” he told me. “Never landed one.” I took a dozen casts anyway. The one fish I did hook, however, I managed to land after a heart-pumping battle of ten minutes. In addition to its impressive size, it was also as brightly colored and beautiful of a steelhead as I have ever caught. After netting it, I lifted the fish briefly for quick photo, then gently removed the hook, held it in the current a moment or two, and then suddenly it surged out of my hand back to the river bottom. It would be my only fish of the day, but well worth the time spent chasing it in good company. And yes, I would definitely go trout fishing in the Hoosier State again. Trail Creek not only gets a run of winter steelhead, but also king salmon in the fall, trophy-sized brown trout in the winter, and in the summer an even larger and more energetic strain of steelhead known as Skamania. Listening to Aaron’s stories, I want to hook one of those some day.